Have you ever been watching a sports game, where all of a sudden an individual player began absolutely dominating the game, and everything they did turned to gold? Or have you seen an athlete at the Olympic games come out and smash their personal best and the world record at the same time? Scientists associate this exceptional performance with what’s called a “flow state”. And when an athlete enters into this “flow” state, they simply perform at a new level of excellence. This “flow” state doesn’t exist in just sports. You can get into a “flow state” in any area, including song writing. In fact, music and other areas that require creativity actually depend on your ability to enter into this state. It’s in this “flow state” where self two will take over, and the gifted songwriter in you will naturally emerge, and create some truly mesmerizing music! Let’s take a look at some interesting points about this “flow state”. If you surf over to Wikipedia.com, you’ll find the following information that is known about being in this high performance flow state. Firstly, Flow is the mental state of operation in which the person is fully immersed in what he or she is doing, characterized by a feeling of energized focus, full involvement, and success in the process of the activity. While in “Flow”, you will feel a loss of the feeling of self-consciousness, and the merging of action and awareness. In “flow” The activity you are engaged in is intrinsically rewarding, so there is an effortlessness of action. If we were to look inside the brain of a person in this “flow state”, what would we see? Neurofeedback trainer and therapist Anna Wise, was also interested in this question, so over a period of three decades she measured the brain wave patterns of a number of exceptional spiritual teachers, artists, high-performing businessmen, athletes, and other highly creative individuals. Now before I explain what the results of her studies were, let me give you a very basic education in brain wave states. In your mind, 24hours a day there are nerve cells in your brain that generate electrical impulses. These “impulses” fluctuate rhythmically in distinct patterns known as brain waves. The frequency of these brain wave patterns (which means, the speed at which they are vibrating) is closely related to your thoughts, your emotions, your state of being, and the functioning of the various systems of your body. For an idea of how your brain waves relate to the way you act, the way you feel, and everything else that happens within you, let’s look at the four main brain wave categories. Firstly the Beta brain wave: These brain waves vibrate in between 14 and 30 cycles per second. When your brain is creating beta waves, you are in an everyday waking state. Things like arousal, alertness, and intellectual processing are all associated with the beta brain waves your mind produces. If you begin making high beta waves (up and towards the 30 cycles per second region), you will have feelings of stress, disease, and panic. If you begin producing slower brain waves in between 8 and 13.9 cycles per second, you will be making what’s known as alpha brain waves. These brain waves are closely associated with relaxation, superlearning, relaxed focus, and the feeling of being in a light trance. Your brain begins making alpha waves when you are just falling asleep, feeling drowsy, or feeling extremely relaxed. When you are creating low alpha waves at around the 8 cycles per second, you are beginning to access some of the “unconscious” regions of your mind that are normally “offline”. Creating low alpha waves, in a way forms a bridge between your conscious mind and your unconscious mind. Do you think this could be helpful in creative tasks such as song writing? Well… You’re onto something there! Now, If you get slower still, you begin making theta brain waves. The frequency of these brain waves lie in between 4 and 7.9 cycles per second. Normally when your brain is creating theta brain waves you are in REM, which means a state of dreaming sleep. However it is possible to create theta waves while you are awake, and this has a lot to do with getting into your “flow state”. Also, there is a strong link between these theta waves, and an increased level of creativity. This is because when you’re producing theta waves, you are accessing parts of your mind that are normally unconscious and out of your awareness. Producing these theta waves is key to accessing your vast reservoir of knowledge and ability that is usually “offline”. More on this in a moment. The final category of brain waves is the delta range, which lies in between 0.9 and 3.9 cycles per second. Delta waves are produced when you are in a deep, dreamless sleep. Delta waves are also closely associated with deep meditation, intuition, and empathy. So What’s This Got To Do With Becoming An Amazing Song Writer? I’m getting to that… and it will be worth the wait, I promise! Anna noticed that all of these highly creative artists, athletes, businessman, spiritual figures… they all exhibit a very specific brain wave pattern when in this state of increased performance and creativity. Anna calls this state the Awakened Mind. I call it the ultimate state to write music from, otherwise known as the “flow state” or the point where “self two” takes over. In this high performance state, these subjects were producing not only beta and alpha brain waves, which are the brain waves associated with a normal “waking” state, but also a significant amount of theta brain waves and a small amount of delta brain waves. This shows that they were accessing regions of their mind that are usually “offline”. It shows that they are using their unconscious resources, which is where the vast majority of processing and natural ability lies. In song writing, it’s this “flow state” that will allow you to discover your most brilliant ideas. If you can learn how to get into this state, you will begin leveraging your full potential as a songwriter. With this said: how can you easily immerse yourself in this ultra high performance state? Well the short answer is this: if you can reach a state of profound relaxation, you will begin creating enough alpha waves that will form the bridge between your conscious and unconscious resources. From this point your mind will begin creating theta brain waves and a small amount of delta brain waves. And as you continue to absorb yourself in creative activities once you’ve entered this state, you will sink deeper into this “flow state”. In a later article I will give you some more specific tips to find this state of ultra creativity and performance. 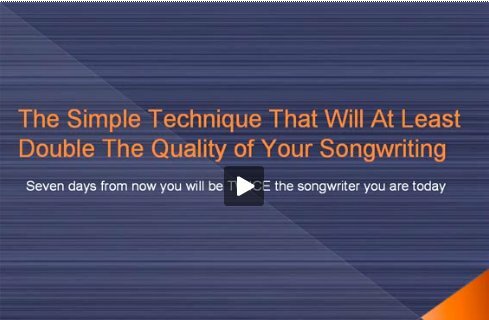 In the next part though, you are going to learn the number one mistake that holds back the majority of songwriters from reaching their full potential with their song writing. I know you’ll be pleasantly surprised when you learn how easy it is to avoid this common mistake.